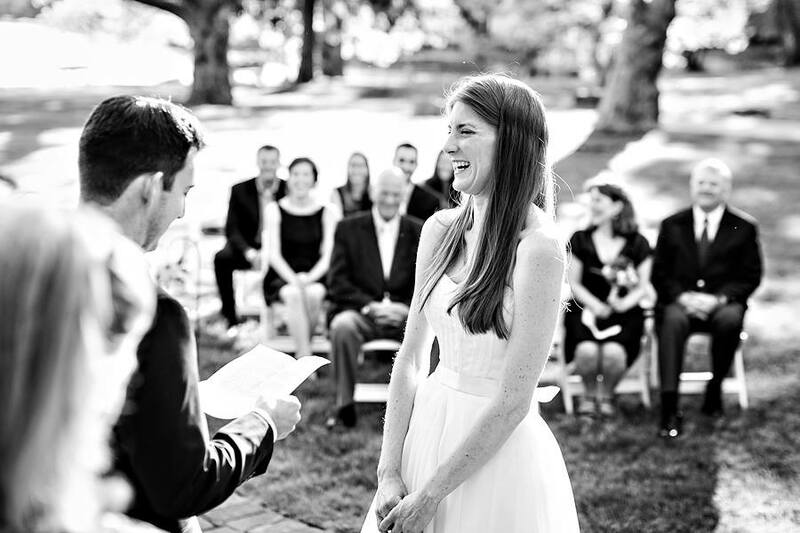 Writing your own wedding vows is no small undertaking. Love is such a crazy, abstract thing to put into words–not to mention the pressure of stringing your thoughts together and delivering them, eloquently, in front of dozens, sometimes hundreds of people. But when you think about it, why shouldn’t you be able to express your own very personal feelings in your very own words on the one day dedicated to celebrating how love has changed your life? Well, because condensing something as big and complex as love into a short speech is really hard, especially when you layer on any self-imposed need to be creative, funny, or overly romantic. There’s a reason so many DIY vow writers rely on song lyrics and poems: The words—and here I’ll go ahead and do the same—get in the way. You know what you feel, but feelings often get lost in the translation. Writing your own vows doesn’t have to be a struggle or a task you put off till the night before. Just adjust your perception of what you’re trying to achieve, follow these simple tips and you’ll find the words will start flowing. Remind yourself: You’re not trying to become the next Shakespeare. You’re trying to express your feelings in the most meaningful, personal way you can. Your soon-to-be wife knows who you are: She doesn’t expect you to suddenly burst into song or produce a sonnet in iambic pentameter. In my opinion, the best vows—in most cases, the best speeches—are straightforward and, above all, honest. So speak directly from the heart. Literally, start by thinking about how you feel about your fiancé or fiancée. Ask yourself the answer to some of the questions below. Write that down. Add in an element of fun, or maybe poignancy, or both. String the most compelling pieces together. Start with a name; end with “I love you.” Are you getting somewhere? What five words best describe [loved one]? How does [loved one] make me a better person? What are small but wonderful things I love about [loved one] that only I get to notice every day? Why am I lucky to have [loved one] in my life? How do I feel about or envision our future together? Maybe it’s starting to look a little like this? Max, before I met you, my days seemed to blend into weeks, and weeks into months. Things were good, but something was missing—I didn’t really have that excitement about what was still to come. Then you came into my life, and now I can truly say each moment is a gift. You are full of hope and kindness. You’re generous, intelligent, and so handsome, I still blush when you turn your dark green eyes my way. When we are together, I feel completely confident in myself, and I find myself more enthusiastic about each day because it starts and ends with you. I love the way you make me laugh with your sweet, goofy impressions, and I love the tiny smiles you try to hold back when you’ve landed a really good joke and you know it. You are my perfect travel companion, my favorite shoulder to cry on when I’ve had a rough day, and the most passionate ice-cream sundae maker I’ve ever known. You don’t even seem to mind my terrible attempts at baking or my inability to keep any houseplant we’ve ever had alive for more than a month. The world is better and brighter when I’m holding your hand–and I feel so incredibly lucky that I get to do it for the rest of our lives. I love you. Don’t worry about being poetic. If the feelings you’re expressing are genuine, the poetry will follow naturally—I promise. Don’t worry about clichés. Do you want to say “I love you to the moon and back”? Just say it! Don’t worry about your “audience.” They’re just along for the ride; the only person who matters is standing directly opposite you. Don’t try to recount the whole tale of how you met. That’s cocktail party and meet-the-relatives fodder; today is all about the highlights. Put down the dictionary. If you don’t know what the word means, now is not the time to test it out. Put down the thesaurus. Again, your loved one might be extremely emotional, crying, or still nervous from delivering his or her own vows—don’t disguise the sentiment in ten dollar words. P.S. If you’re still stuck, call for reinforcements.